The objective of the CIPA initiative is to facilitate the adoption of a new paradigm for assessment of clinical potential of TdP that is not measured exclusively by potency of hERG block and not at all by QT prolongation. The new CIPA paradigm will be driven by a suite of mechanistically based in vitro assays coupled to in silico reconstructions of cellular cardiac electrophysiologic activity, with verification of completeness through comparison of predicted and observed responses in human-derived cardiac myocytes. To the extent that the ongoing validation program is successful, we envision petitioning for corresponding changes to regulatory requirements for proarrhythmia assessment and these might include eliminating or waiving the need for the TQT. What it is Not: CIPA will not replace need for careful clinical assessment of electrophysiologic effects in phase 1 ECG safety studies . View more about CiPA here. Since it’s inception in 2013, the CiPA Steering Team has been committed to providing data to the ICH with the goal of updating the S7B and E14 guidances. In support of this goal, the CiPA Steering Team has had an open dialogue with ICH since 2013 and provided multiple updates on progress. Most recently, data from all 4 CiPA Work Streams was delivered to the ICH, who developed a work plan and concept paper detailing next steps regarding updates to the guidances. The concept paper was finalized and approved in November 2018 and describes a two-stages process for development of Q&A documents for both S7B and E14 during each stage. An Implementation Working Group was formed to develop the Q&A documents. The objective of the first stage of the proposed harmonisation work is to provide clarity on how to standardize assays such as multi-ion channel assays, in silico models, in vitro human primary and induced pluripotent cardiomyocyte assays and in vivo evaluation, and apply these learnings to guide predictions and subsequent clinical assessment. E14 Q&As during stage 1 will focus on how to use nonclinical data to inform clinical decision making in specific scenarios that are currently problematic. The work plan species a goal of June 2020 for completion of the first stage. The second stage will further develop Q&As for S7B and E14 on how to use the proarrhythmia prediction algorithms or model results more generally in clinical development. A deadline has not yet been set for this second stage. Read the full concept paper and work plan on the ICH website. Develop voltage clamp protocols for core set of cardiac ion channel types. Develop consensus in silico model to reconstruct electrophysiologic activity within a heart cell. 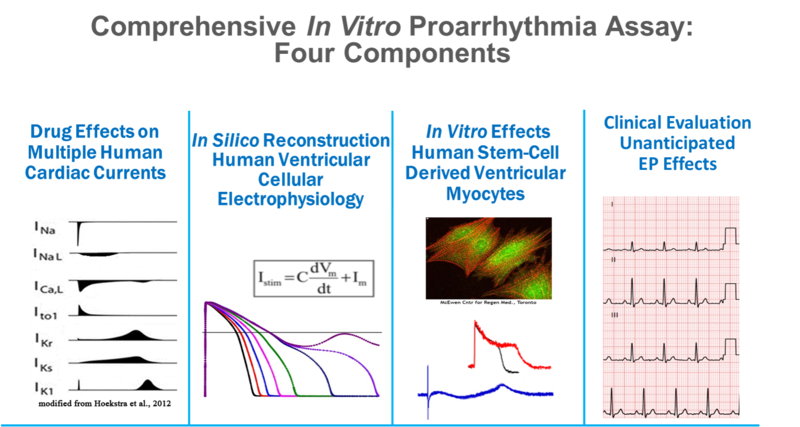 Investigate capabilities of human stem-cell derived cardiomyocyte assays to confirm findings of in vitro and in silico assays. Use human phase 1 ECGs to evaluate potential unanticipated effects. Each CiPA work stream has set project milestones and timelines. See the full details here. While there are many additional partners involved with CIPA, the Steering Team has a new statement about use of the CIPA logo, name or endorsement by the Steering Team. Read the document here. Download the CiPA 28 here!